One of our goals is to provide YOU with High quality oils (Click Here for more Info) for use in Therapeutic Aromatherapy at reasonable prices and to provide you with friendly, personal and speedy service . We are always willing to help you and do the best we can to meet your aromatherapy needs. Our oils are 100% PURE Essential oils! Natural plant essences - one of nature's gifts to us. 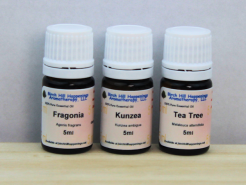 They are the HIGHEST Quality Oils to be used for Therapeutic Aromatherapy. We have done extensive research to find the suppliers of our oils to make sure we are getting the highest quality products. Our suppliers buy their oils directly from the distillers and perform all tests (Gas chromatography and Mass Spectrometry plus several more) on them to make sure they are 100% Pure and not adulterated in any way. All Our oils are tested by Gas Chromatography and Mass Spectrometry and are guaranteed Pesticide and Herbicide Free. They are true 100% PURE essential oils. Many are organic, several are Certified Organic. This way, we know you, Our Customer, will be getting the best Therapeutic oils on the market. Our large selection of Aromatherapy products include all you need to begin to use aromatherapy in your daily life. From beginner to advanced we are there to help you as you learn about aromatherapy and all that true and pure essential oils can provide for your health. NEW (or Advanced) TO AROMATHERAPY and the USE of ESSENTIAL OILS? Health (Physical, Emotional & Spiritual), Beauty & Around the House articles, Recipes, Tips and much more. Once you have finished 'learning' you can easily come back here to fulfill your aromatherapy supply needs. If you have purchased our Products and would be so kind to leave a "Product Review" we would be most appreciative. The Review Product link is found just below the description of the product. Thank you!